Breweries were always well known for the purity of their product and all the Milwaukee breweries originally used artesian wells to tap into a very clean source of water to brew beer. Of course those wells don’t last forever especially when the well is used heavily. The Pabst brewery well lasted until 1902 when it was forced to use city water drawn from the lake. This article tells about that problem and a little bit of the history of that spring. PABST BREWERY ASKS FOR WATER FROM THE CITY. Famous Springs Which Had a Reputation in the Days of the Indians Appear to Have Yielded All Their Resources to the Making of Beer and Another Supply is Needed. The artesian wells which have for many years supplied the water for the famous products of the Pabst Brewery have failed and the company has petitioned the city authorities for water accommodations and will be supplied with a large main, which will be laid from Third and Prairie streets. The springs at the brewery were famous long before the site was selected for the largest brewery in the world and the water which gushed from the earth there was known among the Indians as the great “Mankaki waters” at a time when the great northwest was a wilderness. The springs were enlarged by Jacob Best, founder of the brewery, and later the artesian wells were sunk as the flow from the springs was not sufficient to supply the greatly increased needs of the brewery. 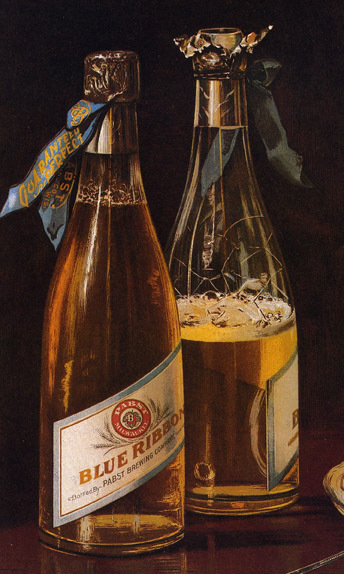 For nearly a score of years this water has been used to make the body of the Pabst beer and its purity and wholesomeness have been a great boon to the company. About one year ago the supply began to fail and it has been a great source of worry to the company, and at present a large quantity of city water is being used. Last month alone more than $5,000 worth of water was purchased from the city mains and as soon as the big 15-inch pipe which the city engineer will ask to be laid is tapped, the company will probably become the largest user of municipal water. Today, although it is becoming harder to find, a rare few local bars have free happy hour spreads which bring back memories of the old days. Otherwise, you have to travel to Spain to get the traditional free tapas with your beer. A good spanish tavern will provide you with a small sandwich tapa or “cover” to keep the flies out of your beer! 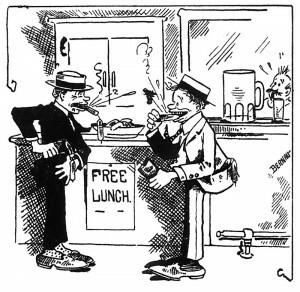 In the July 27th edition of the Journal, an article entitled “Alderman Denies Reporting Opposition to Free Lunch”, Alderman W. I. Greene of the 18th ward denied a rumor that he was going to introduce an ordinance into the council to abolish free lunches. Eventually, the larger battle against alcohol resulted in the Volstead Act, beginning on January 17, 1920 and saloons had the bigger worry of not being able to sell beer at all. I hope everyone had a great Thanksgiving Day! This was an article from the Milwaukee Free Press newspaper of 1910 which told many stories from 19th century papers, a few of which I reproduce here. The Free Press existed from 1901 until about 1918. Thanksgiving Day is an American institution, distinctively. There is none more American, not excepting the Indian or baseball. And while baseball may have as firm a hold -almost- upon the nation as has Thanksgiving Day, it has not the dignity which a long, long, long, tried and true affection gives to Thanksgiving Day. Since 1621, when Governor Bradford of the Massachusetts Bay Colony proclaimed the first Thanksgiving feast, turkeys and pumpkin pies, nuts, apples, mince pies and native wines have been consumed in festive quantities and prayers of thanksgiving have been offered once every year lest the people of this broad land forget the bounteous provision for them by the Father of us all. The piece de resistance of that first communal celebration of Thanksgiving Day in Plymouth, when all the village gathered about one banquet board, was, perforce, turkey, and wild turkey at that, for no other meat was so easily obtainable. This primitive bird established himself on that occasion, nearly three hundred years ago as the bird of birds for the Thanksgiving feast, and to his barnyard descendants he has bequethed the proud distinction. But while the custom of giving thanks for the blessings of the year prevailed in the early colonies it did not rapidly spread to other districts of the United States. So late as the 50’s Milwaukee papers are printed without any reference to a Thanksgiving proclamation or celebration and no notice is made of any church services or other events to differentiate the last Thursday of November from other days. But in the past half century the day has become better established as a national holiday with each succeeding observance and now it would be hard indeed to wean this nation from its custom, which has made the day pre-eminently one of family reunions and of pleasures, and although the religious observance is not so generally emphasized as in the past, still congregations of goodly size gather in the different churches. In the 1860 Thanksgiving newspapers, mention was made of an ovation given Carl Schurz, upon his return to Milwaukee from a political campaign conducted in Indiana, Pennsylvania and New York. A copy of November 27th, 1861 issue of a Milwaukee tri-weekly sheet, puts in agate all of its Thanksgiving “stuff”, which consisted of the proclamation of Governor Alexander W. Randall; everything else was seemingly crowded out by the war stories, given under such heads as “Fort Pickens Opens Fire on the Rebels!” “Bragg Take the Bombardment Coolly!” “Warrington Burned on the First Day!” “The Cause of Blenker’s Resignation Made Known!” “General McClellan Censures Him!” The next succeeding issue prints a front page story of a Thanksgiving function, described as “a public assemblage held in the Newhall house,” at which Judge John F. Potter, who was passing through Milwaukee en route for Washington D.C. to enter congress, made a speech. In the editorial printed the next year on Thanksgiving, November 27, 1862 a portion reads: “We have two distinctly American holidays, Thanksgiving and July 4th. Still no mention of the day being set aside for football or theater is found. In 1865 the first suggestion of Thanksgiving “sports” crept into the newspaper columns. The paper told the story of a race on the festive day between the tug “Muir” and the tub “Tifft” being respectively the property of Captain Porter and Henry Starkey. Here is a late nineteenth century newspaper story when a moral battle was being waged in Milwaukee. Priests and do-gooders were trying to get the city to shut down “dens of vice and sin” in downtown but the battle was hard to fight as many politicians were either “on the take” or sympathetic to “business interests”. SEVERAL DIVES ARE RUNNING IN FULL BLAST. Iniquitous Dens Licensed as Liquor Shops by Ald. Fehr and His Associates-Places Where Young Girls and Boys Go-Scenes Witnessed and Described by a Sentinel Man. The police officers of the city made a directory of these disreputable resorts-it might have been considerably enlarged. The facts were presented to the Common Council as reasons why they should not be relicensed, yet a majority of the aldermen, including Herman Fehr, the Democratic nominee for mayor, voted to license nearly all of these places. Under the surveillance of the police many of these disreputable resorts have been a little more careful in conducting their places since then, and some of them have abandoned altogether the stall feature of their saloons. There is, however, much yet to be done if Milwaukee is to be purged of all these dives. Perhaps police vigilance as of late has been relaxed. A tour made by a Sentinel reporter through some of the blacklisted places certainly shows that there are many which never ought to have been licensed and which a reputable board of alderman surely will not again license. A reporter was detailed to visit the stall saloons that were licensed by Ald. Fehr and his colleagues in the Common council last summer in the face of the protest of Chief of Police Jannsen and the opposition of many aldermen. The good work of the police, the obliquy of the reputation they required during the agitation last summer, or the hard times that set in, have militated against the success of the stall saloons that were duly licensed nine months ago not more than a dozen are now conducting business on the stall plan. Many of the proprieters either sold out their places, took out their stalls or went out of the business. Prominent among the places that have been obliterated is that kept by H. L. Diederichs, on River street. This den was thus described by the police as one of the “lowest and toughest dives in the city.” Diederichs has gone out of the business and the old stand is now classified in the ledgers of the police as a straight house of ill-fame. There is no license there now, and pop and soda water are dispensed at the bar. When the reporter entered the place on his round the scene that the room presented was a hideous one. The air was as thick with smoke as was the air of the Liederkranz hall at 3 o’clock on the afternoon of the Democratic city convention. A crowd of men and women were standing at the bar. Dock men, railroad men, sailors and laboring men, with the clay soil clinging to their boots, were there, and for each man was a woman clad in garments that would pass for a Mother Hubbard. Along the wall were seated other women, some apparently “engaged.” others with their eyes on the door, waiting to get their claws on a bird of passage. Two new male arrivals-one tall and slender, the other short and fat, were seized on by correspondingly built sylphs in pink dresses, who expressed in various ways a perfect willingness to be entertained bibulously and musically. Behind the bar-room were the stalls, and through the open doors came the sinister sound that the mixture of profanity and laughter in female voices makes. Nothing was sub rosa, and the girls exercised their wiles with brazen effrontery. The one redeeming feature of this establishment when it was at its worst was that there were no boys visible in the crowd, and that the women appeared to be quite capable of taking their own part. This picture applies to the place as it appeared last summer, when Diederichs kept it as a stall saloon, and the council voted to license it. Last night the character of the crowd was changed. It had diminished and the soft drinks were not very much sought after. The same gauzy costumes and painted faces were seen peeping out from every side as the outside door opened, but the stalls had vanished. 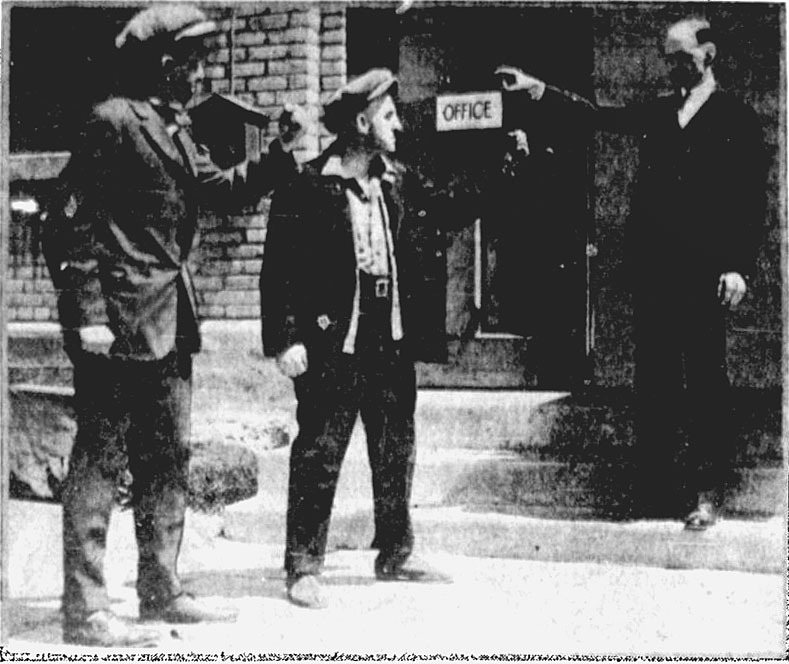 John Sheldon’s two stall saloons (located on Wells street and on Third street respectively) were next visited. These two places are giving the police more trouble now on account of their stall work than any others in the city. Eight girls were taken out of the two places within a week. The Wells street place is at 223 Wells. Entering the place from the street by the main entrance-it ought to be understood that there are many entrances to these stall saloons-the unsophisticated person would think he had made a mistake and entered some other saloon than the notorious place that Sheldon keeps. It is a little square room, the only furniture of which is a little bar, and ice-box and a lunch counter without any lunch on it. There is no one in the house apparently but the bartender, who furnishes any beverage that is desired by the customer. As one sips his liquor, resting his foot on the iron footrail, he enters into conversation with the bartender, who allows that business is dull and that politics have not helped things yet. “Would you like to sit down?” asked the bartender suddenly, and with a view to investigating the mysteries of the stalls, the reporter consents. The bartender starts back and opens a door concealed by the ice-box, showing an entry. A little square room the size of a good sized dry-goods box, with a round table and four chairs, are at the end of the passage. The newspaper man and his companion take seats, and the bartender disappears with an order for drinks. As he disappears, however, there is a swish of skirts and two robust female forms appear. They are fat and once might have been fair, of the uncertain age. they looked very much alike. As they seemed to belong there, a question on the subject elicited the information that they had only just arrived through the “ladies’ entrance,” and that they had been on the lookout for a drink. Would they drink? Yes, but beer was not strong enough. What was their favorite? Cocktails. Ring the bell, and the bartender appears with “cocktails for the ladies.” He seems to know their drinks by intuition. The women thought they were talking to detectives, but their minds were disabused on learning that the visitors were politicians bound for the barbers’ ball. They had just arrived from Omaha, they said, and didn’t like Milwaukee. After a few minutes’ discussion with the women, in which it developed that they were not ingenue by any means, the reporter and his friend made their escape from the dingy hole, and the fat girls returned presumably to their loop-holes of observation to take notice of the next fly that would enter the spider’s web through the front door. At Sheldon’s Third street place (No. 192) there were no girls visible. There were a couple of men outside the bar, one of whom wore the Fehr badge. The bartender said they were all going to vote for Fehr. The police took five girls out of the place during holy week. Al Schissler’s place, at 236 Fourth street, was next visited. The number of stalls and rooms-the upper floor being occupied with private rooms which are kept by the saloon man for couples-is twelve, and from each is an electric bell which is connected with an indicator back of the bar. Above the indicator is a very good campaign picture of Ald. Fehr. Another is attached to a green and white Hazel Kirke sign on the side of the stall. The stalls are separated from the saloon and from each other by partitions eight or nine feet high. Two young girls were taken out of this place last week, the saloon being constantly under police surveillance. The stalls were partly occupied, as the ringing of the electric bell told frequently, although it seemed to be an off night for the sports. A voice, which seemed to be the voices of the half-drunken woman, came from one of the stalls in the phrase, “The h–l you did!” and other remarks that might have been well-timed and suited to the limited capacity of her companion. One of the men who stood at the bar as the reporter entered seemed to hear a voice that he knew, for he said, “I guess I’ll go in a minute,” and pushed into the stall. He was greeted in the ordinary friendly manner of the rough, “Hullo, you —- —- pup,” and seemed to like it, for the indicator bell rang and the bartender proceeded to fill and order for two glasses of bock beer. In half an hour more people used the side door than the front door, and the patter of feet was heard on the stairway that led to the more roomy quarters above. Schissler’s place is patronized as well in the day as at night. There are few hours in the day when couples are not seen by the neighbors wending their way along the street till they reached the corner when they separated, the girl going in by the private entrance on Cedar street and the man by the front door on Fourth. The reporters observed a childish couple-neither of the two apparently over 18-enter the place in this way not two weeks ago. It is charitable to hope that these meetings are harmless, and that the men and women and boys and girls who go there meet simply for political purposes or to drink a glass of beer together. It is an excellent place for one interested in the problems of nature to study the workings of the worst type of stall saloons that is to be seen in the city. Mulcahey’s place at 174 Fifth street was quiet when the reporter reached it at 10:30. This is a small place, with stalls up stairs. The bartender bewailed the bad times, saying that the politicians had not been around since the caucuses. Just then there was a rap on the hall door and female voices were heard, ascending to the upper regions. FREQUENTED BY YOUNG BOYS AND GIRLS. Joe Dalman’s place at 134 Third street, known as the Columbia, was doing a lively business that night, but the detectives spoiled it for the time being. As the reporter stood at the bar contemplating his face in the glass, two officer’s in citizens’ clothes came in. their mission was to take out two young girls whom they knew were there, but the girls escaped by the back door. The place is frequented, the officers say, by young girls and young boys. SOME OF THE OTHER SALOONS. Joe Streeter’s place at 86 Second street is a stall saloon, and is a convenient hang-out for the element of politicians that reside on lower Clybourn street. As the reporter entered the place a rather rocky-looking man was led in the side door by a fat girl with puckery eyes and raven-colored cuffs. A number of other so-called stall saloons were visited where there was no “company” and a number of others where there were no stalls. “The Ko-Ko” at 41 Biddle street has been turned into a restaurant. The saloon kept by Joseph Preiss at 64 Johnson street was presided over by Mrs. Preiss. She said that she “had no girls anymore.” At the hotel of Christian W. Brink, 286 Fifth street, a pretty brunette in a loose pink gown was shaking dice with a stout built elderly man, at the bar, while Mrs. Brink stood at the bar and acted as an umpire. The girl told one of the party, who expressed a wish to make better acquaintance with her, that she expected to go to St. Louis Tuesday and would be unable to see him. The girl acted as cup-bearer and cigar-dispenser for the company in general, flitting around the saloon like a dragon moth. Another girl was visible in a rear apartment. She was similarly attired, but did not come out to join the company in the saloon. This ornamental workshop was one of the large, early companies specializing in large sculptures in the city. It was founded by two German immigrants in 1886; Carl Kuehns and Otto Papke. Carl was a woodcarver and Otto was an artistic plasterer. Together they created numerous works of art and mixed with the large groups of German artists and artisans downtown. The article mentions the work of the company included the lost statue of Germania that was removed from the Germania Building after the start of World War 1. Other sculptures that were done by Carl Kuehns include the Pabst statue of King Gambrinus, the statue of Aurora which was at the old Schlitz Palm Garden downtown, and he even carved circus wagons for Ringling Brothers. The following article is from the Milwaukee Journal of February 17, 1906 and gives a general overview of the company. While other cities are boasting of their magnificent statues along their boulevards, of their beautiful decorations in places of public interest, Milwaukee can go them one better by declaiming that the works of art about the city are the products of Milwaukee artists. When the city desires to erect a monument commemorative of some brave deed or historic event, Milwaukee artists are called upon to do the work. When the local citizen wants to build a structure calling for artistic interior decorations of bronze and stone, he can find the best workmen in this city. The firm was organized in 1886 with C. Kuehns and O. H. Papke as proprietors. Mr. Kuehns is a sculptor of the highest ability, having been graduated with honors from the Academy of Arts in Berlin, Germany. The firm has done a great deal of work for the theaters, churches and public buildings of the city. Among the familiar local objects of art which are the products of this firm is the bronze statue over the entrance to the Germania building, three large reliefs in St. Stanislaus church, and other work of equal ability. The large Statue of Liberty in the old Exposition building was also the work of Mr. Kuehns. The trade of the firm is not confined to the local field. 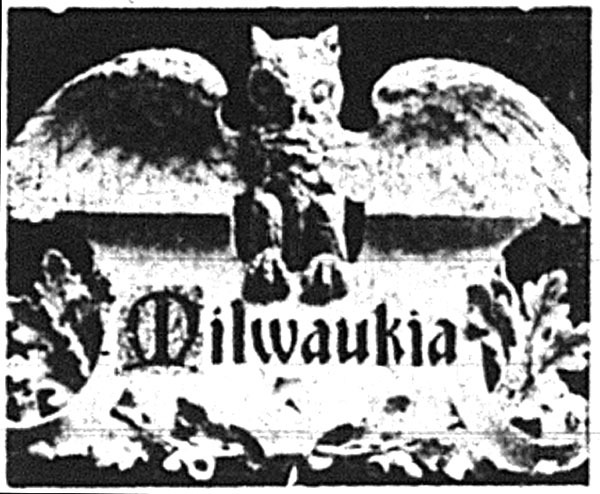 all the ornamental interior decorations in the residence of Col. W. H. Morgan of Alliance, O., were made by this Milwaukee firm. The firm also has produced artistic designs for a number of the largest cathedrals throughout the country, The firm employes nearly fifty skilled workmen in their special lines. Do You Remember Schlitz Park? This is another article in the series written by Frederic Heath in the Milwaukee Leader during 1920-1921. I posted a few others earlier this year and will post more later on. Schlitz Park at North 8th & W. Brown has gone through many name changes over the years and is now known as James W. Beckum Park. The hill mentioned in the article remains, one of the only reminders of the park’s past. Many of the other parks mentioned were scattered around the older parts of the city and have either become public parks or have been sold and developed. Shooting Park has become Clinton Rose Park on King Drive and Burleigh. SCHLITZ PARK IN THE EARLY 80’S? The Milwaukee public park system put the private parks and beer gardens into the discard, but any valued memories remain of the private gardens, and in many ways they played an important part in Milwaukee’s history. There was Quentin’s park, Shooting park (now Pabst park), Miller’s garden, Milwaukee garden, National park (Bielfeld’s garden), etc. Outside the first two, these are all gone. 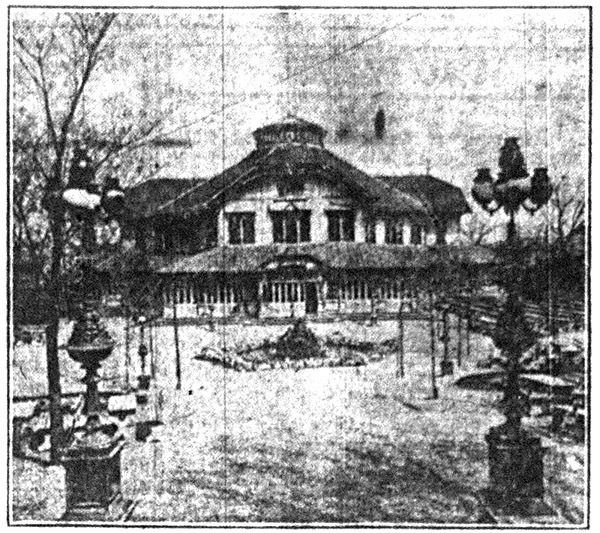 Quentin’s park became Schlitz park, and is now the city’s Lapham park. Here are a few other old time gardens, just to revive your memories: Johannesburg garden, (Ninth and Galena), Rose Hill park, Little Paris (Klein Paris), Schneider’s park (35th & Vliet) where the Socialist-Democrats held their first picnic, Neumiller’s park, and so on. Quentin’s is recalled as it was when it became Schlitz park, and particularly in the early 80’s when the Schlitz park theater was at the zenith of its well deserved fame. Through the summer comic operas and the like were given, under Otto Osthoff, as lessee, by companies of the best obtainable artists, and it had the town virtually at its feet. Gilbert and Sullivan’s comic operas, Pinafore – which ridiculed the British navy – Pirates of Penzance, full of beautiful melodies, etc., had just burst into a world-sweeping fame. Billie Taylor, The Mascot, Chimes of Normandy, Olivette and others ranking second to the Sullivan operas, were also given, with The Bohemian Girl for good measure. Digby Bell, Milwaukee born, came to the park with Orpheus and Euridice, and scored tremendously. James Peake was one of the Park Opera Co. stars. In those days the street railways ran open side step cars in summer, with seats running clear across. But the park opera had its day and waned out. Many other attractions came to the park and even minstrel companies, and it was the scene of many a Labor day picnic, nationality picnics, band concerts, and political mass meetings. The park hill still remains, and it is an interesting fact that early day historians always claimed it was an artificial eminence, heaped up by Indians in the uncharted past. There was an observatory on top of it from which in later years a huge flashlight swept the city. The old pavilion, refreshment room, bowling alleys and veranda drinking tables, near the Eighth street entrance, was torn down some years ago. With the film festival coming up, we should remember that locally produced films are not a new thing. “Milwaukee Love” was probably one of the earliest photoplay films shot in Milwaukee and starred a local amateur cast. It was a silent movie and played at the Strand at 5th & Wisconsin for it’s debut at the end of May, 1926. 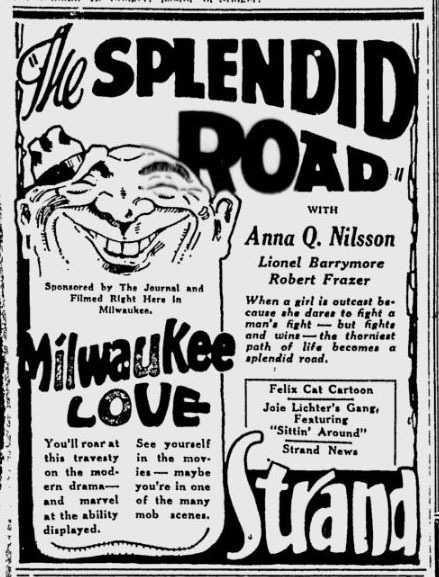 This article tells about the movie and was published in the Milwaukee Journal from May 23, 1926. What has happened to the film and many others like it is anybody’s guess but they are most likely lost forever. Many films from this era were printed on highly unstable nitrate film which at best, would slowly disintegrate over many decades. At worst they would spontaneously combust taking a building along with them. All the thrill of a first night performance came to the members of the cast of “Milwaukee Love,” when the newest of the local movies was flashed upon the Strand screen Saturday. The audience of first-nighters was large and enthusiastic, ready to give generously of their laughter and applause for the home town folks who did their camera bit to entertain. Crowds flocked to the Strand all day Saturday and, judging from their response, the comedy thoroughly pleased them and convinced even the most skeptical that an amateur production can be highly entertaining. “Milwaukee Love,” produced with a Milwaukee cast by Director William Steiner of the Hudris Film Company and sponsored by The Journal will continue at the Strand through Friday. Anita Alsberg as the heroine and Robert Johnson as the hero, who make good despite all obstacles, both perform exceptionally well and screen splendidly. Chauncey Yockey as Papa Atherton proves that he can quit his job as head of the Elks any time and sign up with Lasky or Metro-Goldwyn. Mrs. A. E. Copeland as Mama Atherton gives a finished portrayal of a difficult role. The youngsters, Christine Thompson as Baby Atherton, and Ira Gonyan as the newsboy do a Baby Peggy and Jackie Coogan that is most appealing. Love, well it is a serious matter to many folks, is treated in a deft and lightsome manner in “Milwaukee Love.” That love conquers all seems to be the theme of the picture and certainly this portrayal of local love conquers any objection to laughter. The comedy scenes, which are numerous, drop plenty of laughs. Warwick Beauchamp and Jack Curtis as the villains, lying on the ground with their mouths open after supposedly being killed by a bomb, is more than funny. Full of laughs, too, is the proposal scene, where Robert Johnson, the hero, embraces the heroine with the fervor of Strangler Lewis throwing an opponent for a third fall. The picture finishes with a kaleidoscopic view of Milwaukee streets on a busy day, on which the pedestrians demonstrate all the animation of Keystone coppers rushing to a riot call. 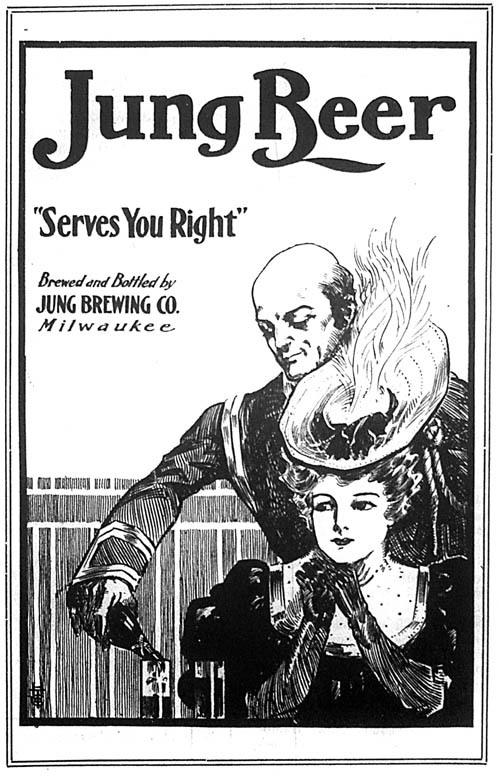 The Jung Brewery grew out of an earlier affiliation with Otto Falk and Ernst Borchert. By the time Prohibition was enacted in 1919, it strangled all Milwaukee breweries and only the largest were able to diversify enough to survive. The Jung Brewing Company by this time was growing but unfortunately did not have the diverse holdings to survive. A few of its remnants could be seen until recently. The main office building of the brewery was still standing at 783 North Water Street until it was torn down in 1984. One of the last standing buildings in its brewery complex at 5th & Cherry was torn down a few years ago. An earlier building off of Pierce Street which was part of the Falk, Jung & Borchert Brewing Company barely stands and may be renovated if money and support can be found. Back in the early 1950’s rail was the best way to get from place to place and the Milwaukee Road served the Midwest well. 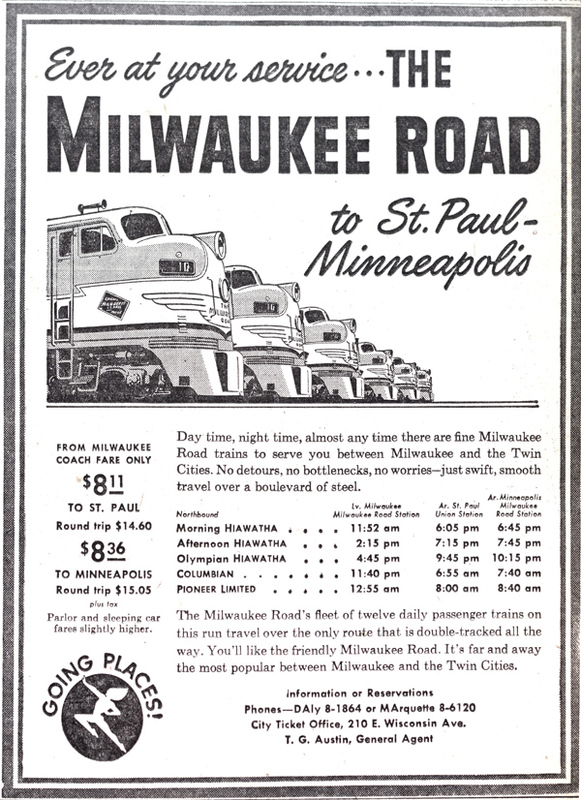 This ad from the Milwaukee Journal listed the costs and speed of the Hiawatha line to get to Minneapolis/St. Paul. The afternoon train took you there in a quick 5- 1/2 hours. Now the Amtrak Hiawatha line is potentially coming back with service which we haven’t seen in awhile. Back before the Wisconsin Center convention center there was the Time Insurance Building at 5th & Wells. Back before the Time Insurance Building there was the Wells Hotel. It was made up of several small buildings which had rooms for rent and taverns and diners on the ground floor. These smaller buildings with diners and taverns were found in all corners of downtown. They were places for socializing during the day when people had simpler lives. You would stop in for a morning coffee and a plate of eggs before work and find a small hole in the wall next door for a cold bottle of Schlitz after work. The smallest diners had enough business on a daily basis that they could stay around for decades. Slowly, progress eroded and closed up these places. The old buildings with lower rents to keep them in the black were still plentiful through the 70’s but those older buildings were torn down regularly. 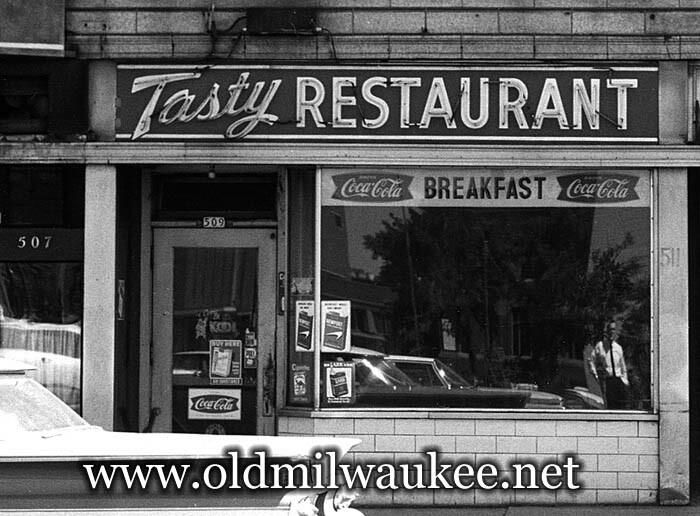 The last real old-school diner was the Michigan Street Diner between Water and Broadway but some old timers may remember Lenrak’s on Old World Third, the Belmont Cafe, Heinemann’s, etc. George Webb’s shares some of the feeling of these places but there was a character to these old restaurants with a patina of the “accumulation of the years”.